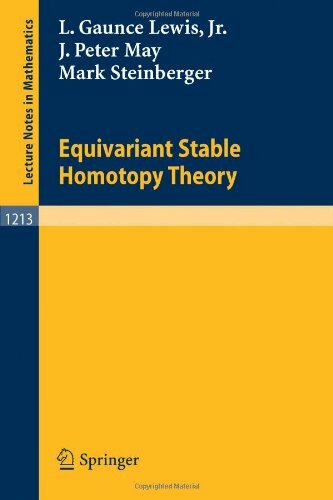 Our primary purpose in this volume is to establish the foundations of equivariant stable homotopy theory. To this end, we shall construct a stable homotopy category of G-spectra enjoying all of the good properties one might reasonably expect, where G is a compact Lie group. We shall use this category to study equivariant duality, equivariant transfer, the Burnside ring, and related topics in equivariant homology and cohomology theory. These are the notes for a course taught at the University of Michigan in 1989 and 1998. The emphasis is on heuristic arguments rather than formal proofs and on varieties rather than schemes. The notes also discuss the proof of the Weil conjectures. This is a comprehensive introduction to the theory of stable commutator length, an important subfield of quantitative topology, with substantial connections to 2-manifolds, dynamics, geometric group theory, bounded cohomology, symplectic topology.